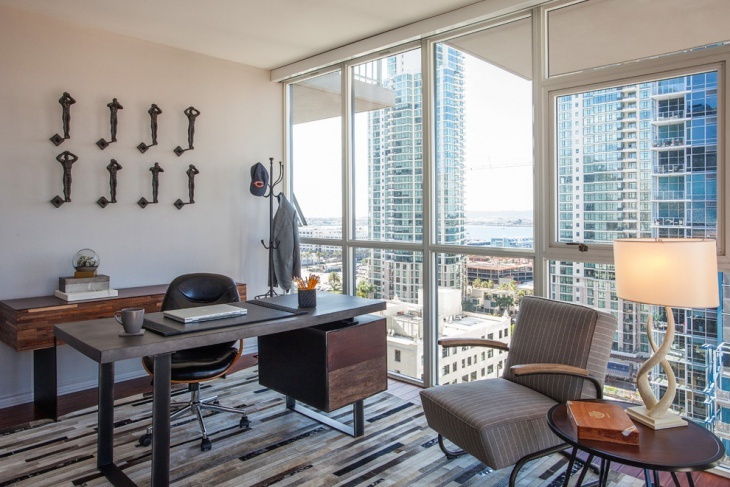 A home office should not be just a simple room with a desk. Creativity should be included when planning for that space in your house where you are going to work. Your productivity can be enhanced if you are comfortable, thus you should check out these creative home office ideas if you want to be professional even when working right at the comfort of your own home. Space is very important in a home office. That is why this spacious home office design is definitely creative in approach. The three-sided desk took the corner space, allowing for an open and cozy space where people can lounge and move around. The round rug at the center and the couch at one end of the desk provide the homey feel. The sliding door that connects the home office to another room offers dual function – as a door to provide privacy and as a blackboard. 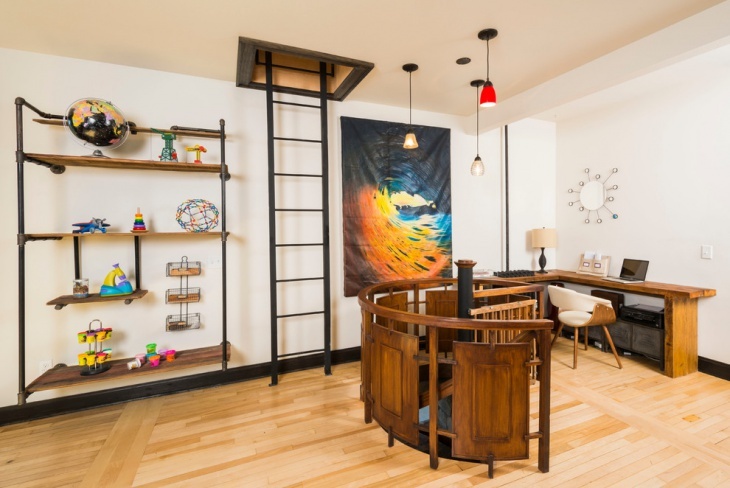 This particular home office is designed with a honey-comb shaped shelving unit that provides a one-of-a-kind display spaces for books, projects and other personal and professional accents. To give emphasis on the minimalist look of this room, only desks and chairs occupy the floor area. 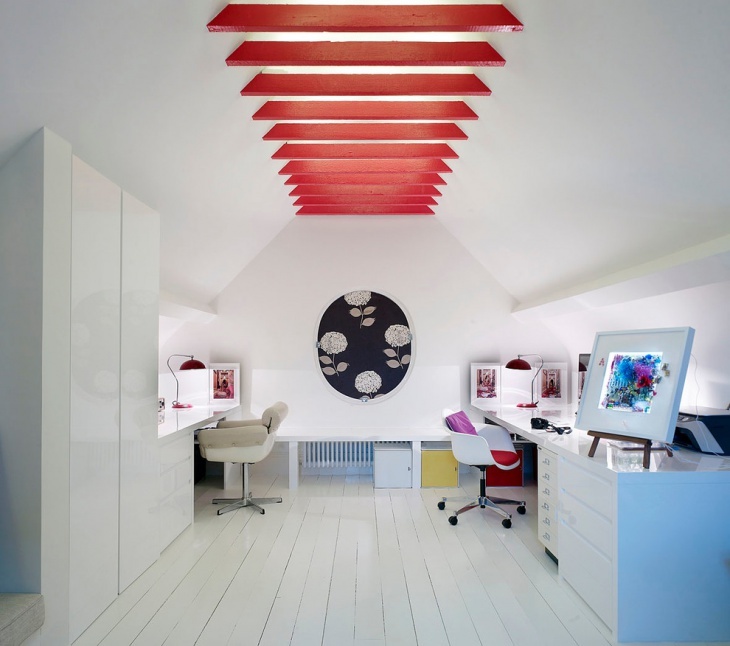 For this home office, the colors are provided by the posters on the walls and the red office chair. 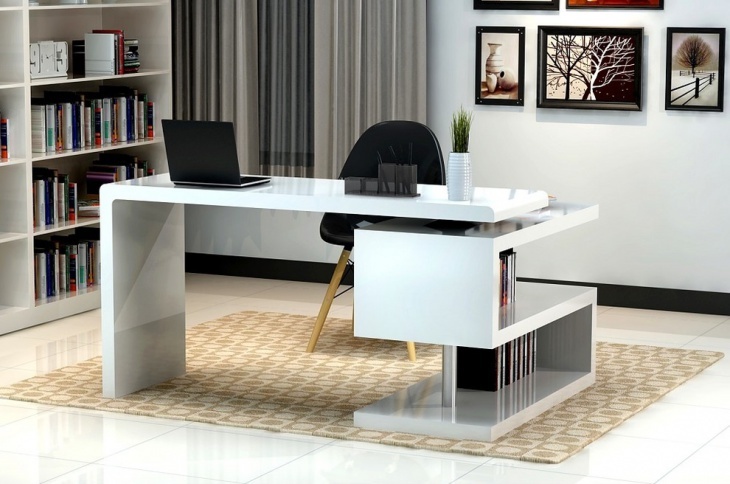 The small and simple square desk on the corner of the room does not take up much space, a good idea that creates a nice illusion of a very spacious room. The Ikea bookcase provide the needed storage space. 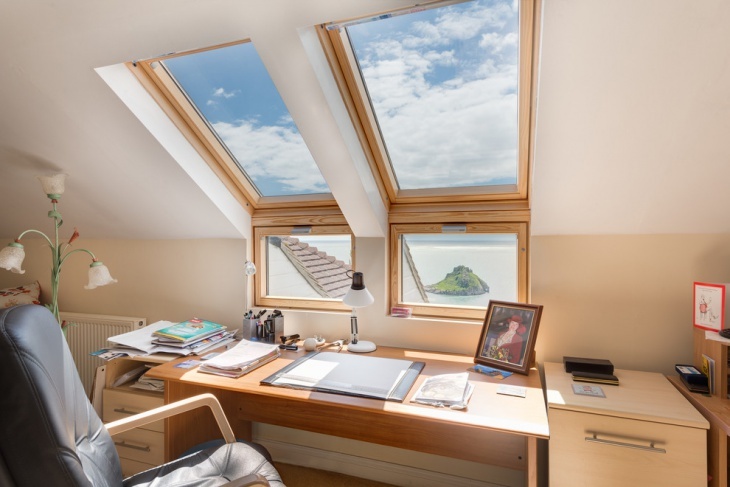 If your home is to crowded on the ground floor for a home office, why not consider using a second floor area for it. 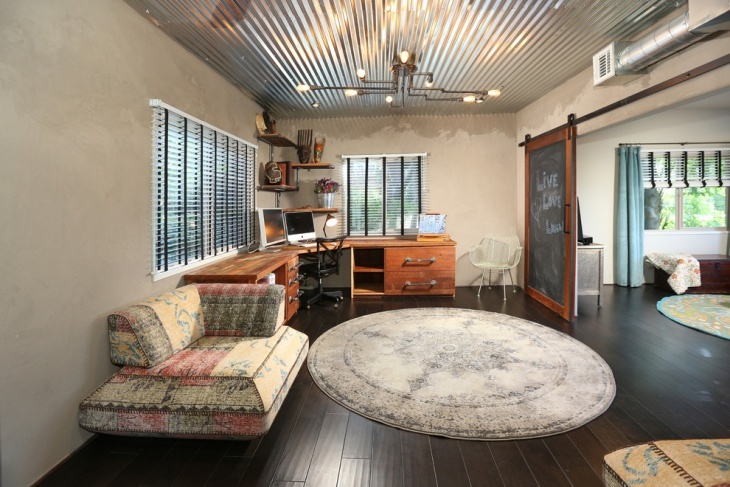 This salvaged style home office has some good features that you may want to check out. The spiral staircase and the ladder leading to another floor indicate the owners’ love for space-saving ideas. 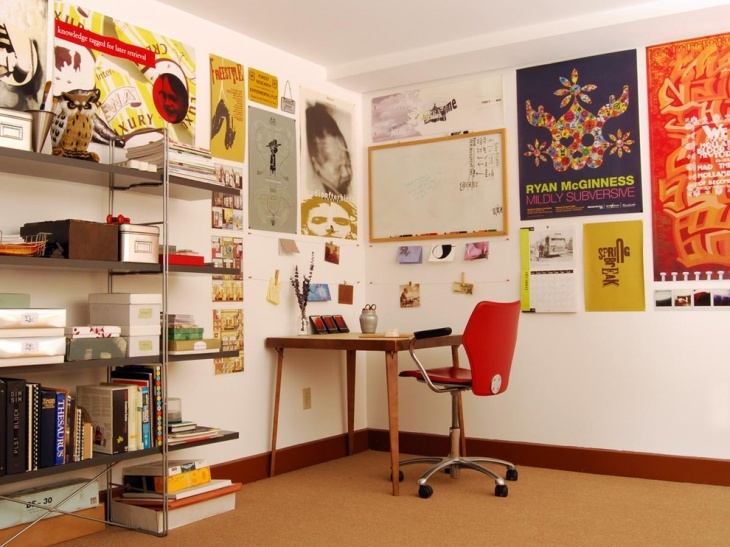 The desk used is L-shaped and placed effectively on the corner, which leave lots of free space on the floor. To give emphasis on the importance of free space, a floating shelving unit is attached to one wall. For this particular home office, a dining chair is used instead of an office chair. This is a good idea that emphasizes the fact that the space if inside a house and not a corporate building. The neon green table/desk gives the room the playful and contemporary appeal. 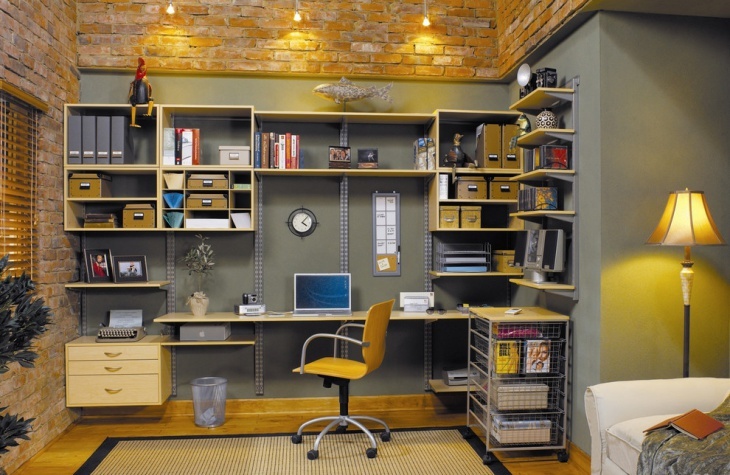 The built-in bookshelf/cabinet on one wall provides the traditional home office/library look. The industrial look is very much a modern design idea. 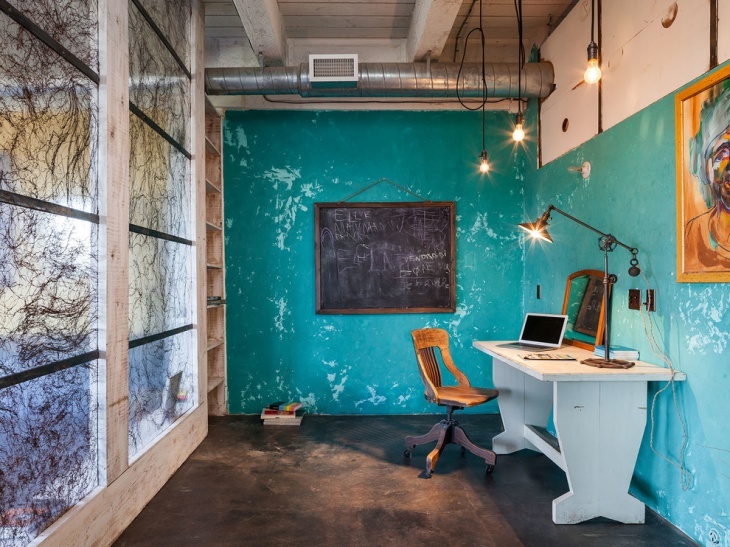 The orange bricks used for one wall and the upper part of the room used for this specific home office provides a contrast to the rather dull gray-color lower walls. 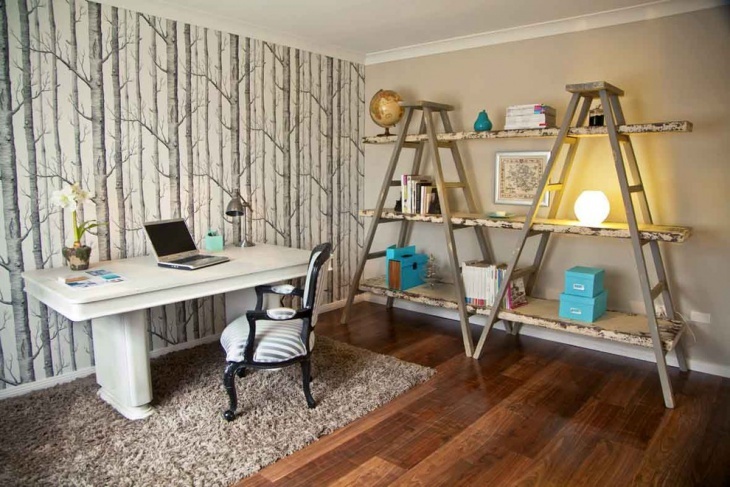 The desk is built into the wall attached shelving unit, making the design a space-saving one. 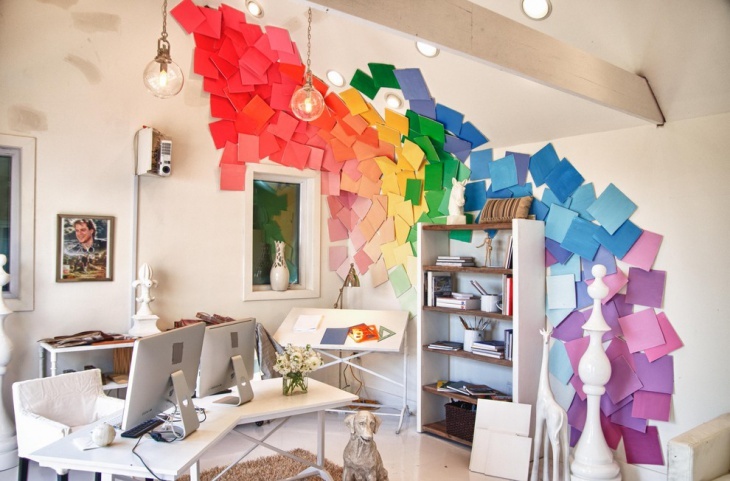 Creativity is at its best on this home office. 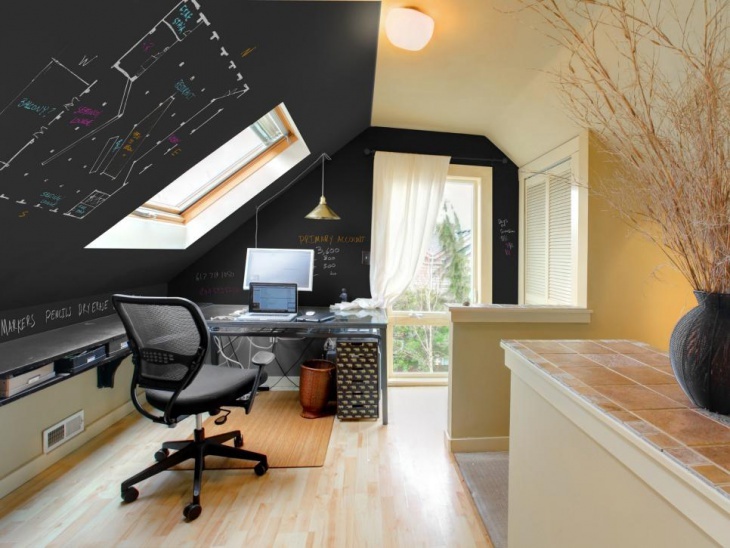 A slanted wall was done in chalkboard paint to provide space for planning, taking notes or problems solving. A small window provides natural lighting to the workspace. The dark wooden desk used for this Mediterranean home office provides a nice and professional look to the whole set up. The desk is big enough to hold a lot of stuff, so it can also serve as display are for some pretty accents or a space where you can place your books. 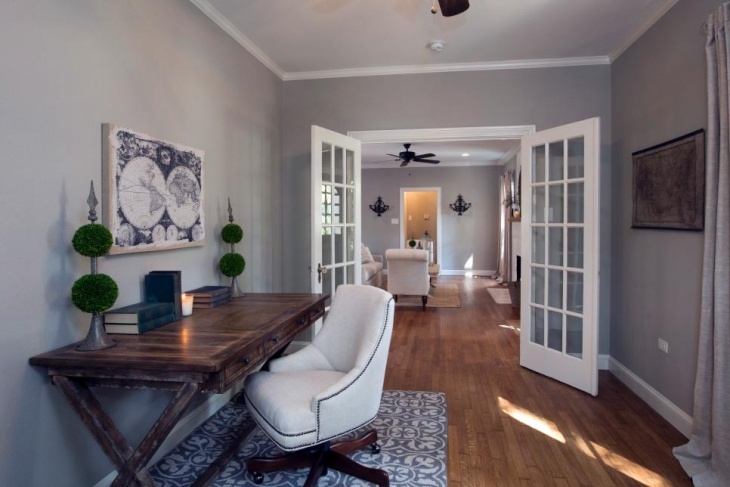 The French door for this home office is the first sign that this is a French styled room. 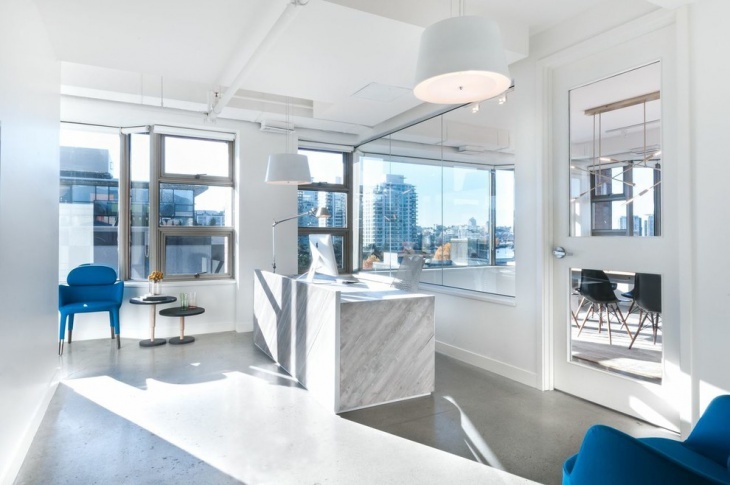 Though the room is basically on the minimalist side, it has the essentials for a home office – a unique desk and an upholstered white chair. 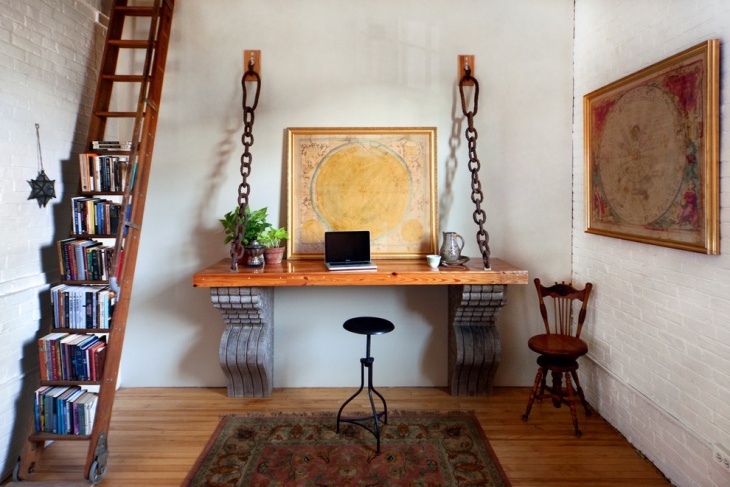 A corner of the house has been turned into a home office and it is designed in a traditional way – with not much adornments. 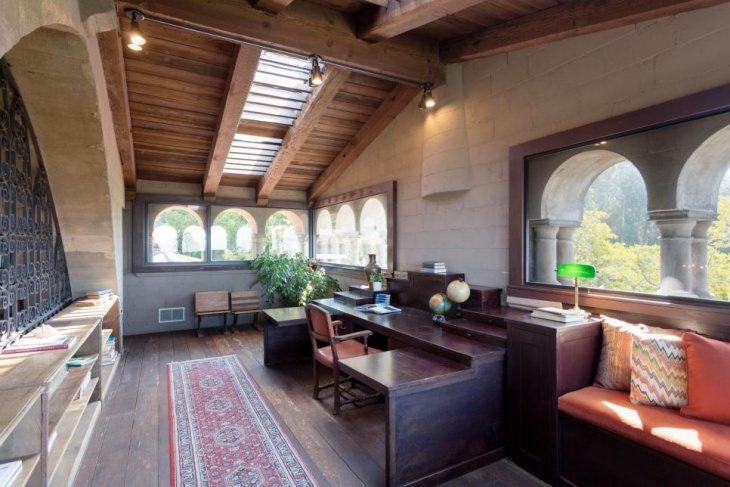 There is that traditional wooden desk facing the casement window (which provides a nice view of the beautiful nature), an office chair, and a nice classic rug.